Farm Size & Methods – comparison of impacts of factory farming vs. pastured animal farming. Factory Farming – an overview of factory farming and related concerns. Urban Farming – problems with urban or backyard animal farming. “Gifting” Animals as Food – problems with animal “gifting” programs, plus better alternatives. 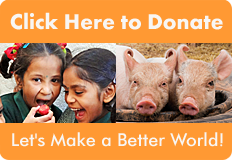 Animal-Related Grants – a list of our grant winners in animal advocacy and protection.